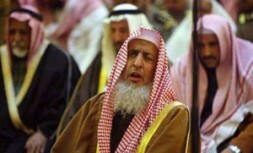 Saudi Grand Mufti Sheikh Abdulaziz Al al-Shaikh. "If you analyze the statement of the Grand Mufti carefully, you can see that it fundamentally contradicts the Holy Qur'an, many more important hadiths, the custom of the prophet in Mecca and Medina, several contracts of the prophet and the first caliph with Christians from 628 such as the Charter of Privileges as well as the path of reconciliation started by the King in 2007." Only half a year before the infamous video "Innocence of Muslims" insulted the prophet and offended many Muslims all over the world (see Dr Hubertus Hoffmann, 'Prophet Mohammed Movie: What should be done? '), the Saudi Arabian Grand Mufti Sheikh Abdulaziz Al al-Shaikh on March 14th, 2012, declared in a fatwa "that it is necessary to destroy all the churches in the region [Arab Peninsula]." He based his proclamation on only one tradition (hadith), wherein the prophet is said to have declared on his deathbed that "there are not to be two religions in the Arab Peninsula", which has always been interpreted to mean that only Islam can be practiced in the region. His statement came in response to a request from a Kuwait-based NGO delegation seeking to clarify Islamic law's position about a proposed Kuwaiti ban on the construction of new churches (reported in Arutz Sheva 7 news, March 16, 2012; Washington Post March 22, 2012). The Grand Mufti is Saudi Arabia's supreme religious official and an important representative of Islam – unlike the unimportant and unofficial ex-convict who produced the insulting video about the prophet in the U.S. Until now this most aggressive remark by the top Saudi religious leader has produced only a 'thundering silence' in the Western world, where no politician dares to speak out and confront anti-Christian hate speech. Moreover, German Chancellor Angela Merkel supports the proposal to sell 200 Leopard 2 tanks to the Saudis which are specially designed for urban fighting against any uprising in Saudi Arabia. This presents the sharpest contrast possible against the outcry in the Islamic country about the 14 minute YouTube video made by a nobody. If you analyze the statement of the Grand Mufti carefully, you can see that it fundamentally contradicts the Holy Qur'an, many more important hadiths, the custom of the prophet in Mecca and Medina, several contracts of the prophet and the first caliph with Christians starting 628 with the Charter of Privileges as well as the path of reconciliation started by the King in 2007. I urge Saudi King Abdullah to take his title as the Custodian of the Two Holy Mosques seriously and impeach the Grand Mufti now, as he did disobey the Prophet and is therefore no longer able to defend Islam as promoted by the Prophet. 1. There are three contracts the Prophet personally signed with Christian communities to protect their churches and Christian ceremonies. The first was the Charter of the Privileges for the St. Catherine Monastery at Mt. Sinai in 628. The prophet himself signed that document to protect the monks which is now on display in the Topkapi Palace in Istanbul. "I, the servants, the helpers, and my followers defend them, because Christians are my citizens; and by Allah I hold out against anything that displeases them. No compulsion is to be on them...no one is to destroy a house of their religion, to damage it...the Muslims are to fight for them...their churches are to be respected. No one of the nations [Muslim] is to disobey the covenant till the Last Day." As well the treaty of the prophet with the Christian governor of Ayla at the Gulf of Aquaba followed in 631 and his contract of Nadjran which was renewed by the first Caliph Abu Bakr in 634. 2. Several peace treaties containing later guarantees for the Christians made by the followers of the Prophet after his death in 632, such as the Hira treaty (635) with full religious rights, Damascus (635), Baalbeck, Hims/Emsea and the contract for Jerusalem (638). Is the Saudi Grand Mufti now more knowledgeable than the first Caliph Abu Bakr and his people who lived with the Prophet and knew his will best or does he now want to disobey these important treaties from the earliest days of Islam which were respected for more than 1300 years? Is the mufti wiser than Abu Bakr? Does he understand Islam better than this follower of the prophet? 3. Many traditions (hadith) spoken by the Prophet preach respect towards the Christians: "Who suppresses a dhimmi [Christians paying tribute] against those I will stand up" and "If any [Muslim] commits injustice, insults, aggravates, mistreats or abuses a person of the People of the Book [Christians and Jews], he will have to answer to me [for his immoral action] on the Day of the Judgement" (Abi Yousef Khiraj, see Izzeddin Blaque, Minhaj Alsaliheen, page 106). "None of you will have faith till he wishes for his brother what he likes for himself." (narrated Anas, Bukhari Volume 1, Book 2, No 13). "You will not enter Paradise unless you have faith, and you cannot be one of the faithful unless you love each other." (Abu Hurayrah, in: Maulana W. Khan, page 92). 4. Several important surahs in the Holy Qur'an: 2:256 "There shall be no compulsion in the religion." 29:46 "Do not argue with the followers of earlier revelations otherwise than in a most kindly manner." 10: 99 "Had your Lord willed, those on earth would have believed - all of them entirely. Would you compel the people in order that they become believers?" 109:6 "For you is your religion, and for me is mine. " The Qur'an also offers freedom of faith (10:108, 6:104, , 39:41, 11:121, 73:19, 43:88-89, 2:272, 76:29, 18:29, 42:48, 76:2-3, 3:20, 88:21-22, 16:82-83, etc. ), freedom of religion (2:256, , 22:67-69, 42:15, 10:41, 2:139, 42:6, etc. ), and freedom of thought (15:3, 17:84, 6:110, 10:11, 11:121, 52:45, etc.) without any temporal punishment. The Qur'an teaches Muslims to believe in all previous Prophets of God as they represent the chain of evolution of the Prophets (2:1-4, 3:84, 2:285, 4:152, 37:37, etc.). In 2:285 "All of them [prophets] believed in Allah and His angels and His books and His messengers, we make no distinction between any of His messengers." So the Grand Mufti wants to just ignore those surahs of God given to Mohammed? 5. The main code of tolerance is the first surah and the description of God which is standing on top of all surahs: "Allah, the Most Gracious, the Most Merciful." Is it merciful to destroy the churches where Christians honor their holy book, God and Jesus, who is a honored prophet in the view of Muslims? The excellent Institute for Arabic and Islamic Studies of the University of Exeter in the United Kingdom argues: "There are two important underlying facts in the Prophet's proposal showing grounds of Muslim's tolerance towards Christianity. The first underlying fact is that the Prophet proposed a new home for Muslims that was governed by a Christian king without any reservation about it being a Christian one. This is an outstanding evidence of Islam's readiness to collaborate and work with Christians in promoting goodness and repelling oppression and evil. The second underlying fact in the Prophet's plan showing Christians' giving acceptance of the Prophet's proposal was that he had no reservation of the Christians not accepting to work with the Muslims. These underlying facts are a momentous proof that Muslims and Christians were not in conflict, but rather in cooperation. Thus, Muslims' and Christians' differences did not prevent the Prophet and the Christians from working together on the many common elements between the Muslims and the Christians. When the Abyssinian Christian delegation arrived in Medina, the Prophet provided them with lodging even in his own Mosque, and he himself attended to their needs, saying: "They have honored our people, so I like to honor them myself." The Christians came to help and rescue their Muslim friends from the boycott of the Quraysh which since 622 had force them into exile in Medina. No member of the Quarysh tribe could deal, trade, or socialise with the Prophet's family. They had to eat grass and insects to survive and his wife Khadeejah and his uncle Abu Talib died shortly after due to the hard living conditions. 33 people in the mixed Muslim-Christian delegation from Abyssina arrived to support the Muslims in Medina. This foreign and Christian intervention into the inner-Meccan political and religious conflict led to a review and a lift of the boycott. The Quraysh leaders Hisham bin Amr, Zuhair bin Umayah, Mut'im ibn 'Addi, and Buhtury ibn Hihsam agreed amongst themselves to "stop the fool act of the boycott" and called the rest of Quraysh leaders into a public meeting at the Kaaba for the purpose of ending the boycott. The meeting was a success and the removal of the boycott was achieved. Qur'an in 28:52-55 honors this Christian support: "Those to whom We sent the Book before this, --they do believe in this [Revelation]; and when it is recited to them, they say: We believe therein, for it is the truth from our Lord: Indeed we have been Muslims (bowing to God's Will) from before this. Twice will they be given their rewards, for that they have preserved, that they avert evil with good, and that they spend in charity out of what We have given them. And when they hear vain talk, they turn away therefrom and say: To us our deeds, and to you yours." When in a later stage the Christians of Najran came to Medina, the Prophet lodged them too in the Mosque and permitted them to hold their prayers on one side of the Mosque, with the Muslims on the other side. In this Mosque, dialogues between Christians and Muslims were conducted with freedom, respect and tolerance. Holiness in Islam was inclusive rather than exclusive. If they wished, Christians could worship in the new mosque of the Prophet finished in April 623 in Medina, because they too were part of God's family, as Karen Armstrong reports (in Muhammad Prophet of Our Time, page 116) Now the Grand Mufti wants to destroy this good custom of the prophet. The Prophet was already well established in Medina in 627/28 when the Christian delegation arrived from the town Najran in South Arabia. It included their leader, the Aqib'nmed "Abd al-Masih" (Servant of Christ), the main administrator, the Sayyid, and their bishop with excellent knowledge of the Christian religion. This visit was the second inter-religious meeting and discussion between leading Christians and the Prophet of Islam. The purpose was to negotiate a treaty with the Muslims. According to Ibn Ishaq the Prophet invited them to hold their Christian prayers in his mosque. They were asked to submit and the Prophet argued that they were held back from submission by their belief that Jesus is the son of God, their worship of the cross and eating pork. After a lengthy discussion about verses of the Qur'an and the Bible the Christians agreed to return home preferring to agree to differ peacefully. 7. The proposal of the Grand Mufti to destroy all churches contradicts all the efforts of Saudi King Abdullah to create inter-religious dialogue and more respect since 2007 and is a severe act of disloyalty. King Abdullah became the first Saudi monarch to visit a pope, meeting Benedict XVI in November 2007. In March 2008, he called for a "brotherly and sincere dialogue between believers from all religions." In June 2008, he held a conference in Mecca to urge Muslim leaders to speak with one voice with Jewish and Christian leaders. In the same month, Saudi Arabia and Spain agreed to hold interfaith dialogue in Spain. This historic conference finally took place in Madrid in July with many religious leaders of different faiths participating. In November 2008, he and his government were responsible for the "Peace of Culture" which took place at the United Nations General Assembly. It brought together Islamic and non-Islamic nations to eradicate preconceptions of Islam and Terrorism. "As Muslims, however, we are also deeply disappointed and offended by the mufti's blatant disregard for the principles for which Islam's Holy Scripture and prophet have stood," wrote Nasim Rehmatullah, National Vice President of the Ahmadiyya Muslim Community, in The Washington Post on March 22, 2012. Christian bishops in Germany, Austria and Russia have sharply criticized Saudi Arabia's top religious official. In separate statements, the Roman Catholic bishops in Germany, lead by its chairman Robert Zollitsch, as well as those in Austria, slammed the ruling by Grand Mufti Sheikh Abdulaziz Al al-Sheikh as an "unacceptable denial of human rights to millions of foreign workers in the Gulf region". Archbishop Mark of Yegoryevsk, head of the Russian Orthodox department for churches abroad, called this fatwa "alarming". At least 3.5 million Christians live in the Arab Gulf region. They are mostly Catholic workers from India and the Philippines, but also Western expatriates of all denominations. Saudi Arabia bans all non-Muslim houses of prayer, forcing Christians to risk arrest by praying in private homes. There are churches for Christian minorities in the United Arab Emirates, Qatar, Kuwait, Bahrain, Oman and Yemen. The bishops' conference in Austria - where Saudi King Abdullah opened the first centre for interfaith dialogue - demanded an official explanation from Riyadh. "How could the Grand Mufti issue a fatwa of such importance behind the back of his king?" they asked. "We see a contradiction between the dialogue being practiced, the efforts of the king and those of his top mufti." This new Saudi sponsored center, which shows Christian tolerance and respect towards mosques and Islam, can only function after a clear statement from the Saudi King. The Catholic Church has urged Muslim states in recent years to give Christian minorities in their countries the same freedom of religion that Muslims enjoy in Western countries. Bishop Paul Hinder, who oversees Catholic churches in the United Arab Emirates, Oman and Yemen, stated "What is worrying is that such statements have influence in part of the population." They promote extremism and hate – is this what the prophet wanted to establish in Mecca and Medina? No, he promoted a new society of "salaam" (peace), self-surrender to God (Islam) and hilm (harmony), moving away from the time of ignorance (jahiliyyah). The Saudi King must defend the prophet now. Dr. Hubertus Hoffmann is Founder and President of www.codesoftolerance.com promoting codes of tolerance and respect towards other religions, ethnic minorities and races. He is author of a forthcoming book entitled "Tolerance! Codes for Peace and Love in Our Global Village".